With BU and Duluth headed to overtime, two things were certain: the final score would be 3-2 and that the result would either be déjà vu or a reversal of fortune. 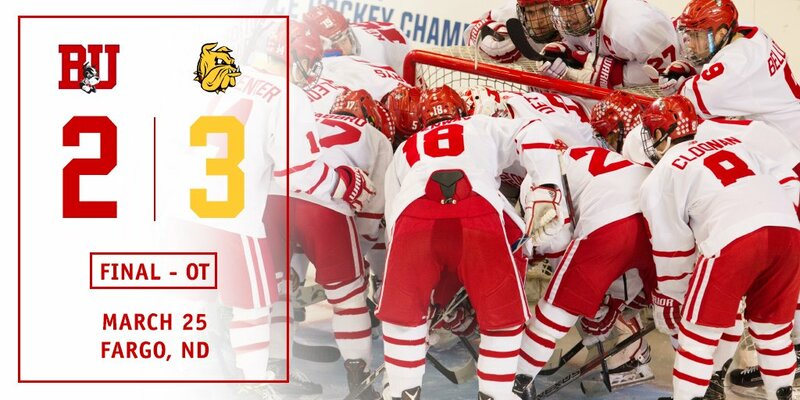 Two years ago, BU punched its ticket to the Frozen Four with a 3-2 win over UMD in the Regional Final. Sadly, that script wasn’t repeated Saturday night, as the Bulldogs scored a power play goal in overtime, sending them to Chicago while the Terriers’ season comes to an end. After Bobo Carpenter was whistled for a trip at 1:39 of the extra session, UMD stopped a BU clearing pass and Adam Johnson fired from the point. His shot hit Doyle Somerby and rebounded to Johnson who skated into the right circle and wristed a shot high to the far corner past a screened Jake Oettinger. The teams had finished the fast-paced first period at 1-1. After Bulldog goalie Hunter Miska stoned Jakob Forsbacka Karlsson with a desperate leg save, BU took the lead on Clayton Keller’s 21st goal. The freshman skated up the left side, cut to the net and backhanded a shot off the post. 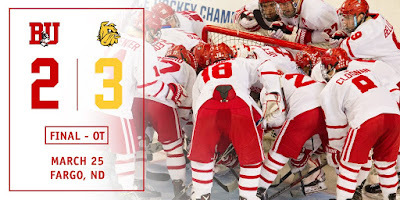 UMD knotted the scored in the period’s final minute when a Terrier center-ice turnover allowed Alex Iafallo to enter the BU zone, skate behind the net and score on a wraparound just before Patrick Harper’s stick could stop the shot. The second period was played at a slower pace with no goals scored, but both teams revved it up in the third. Midway through the period, UMD’s Joey Anderson brought the puck down the right side to the net. Oettinger made the initial save, but Anderson was able to flip the rebound into the cage. BU pressed for an equalizer with Brandon Hickey just missing the top corner with a shot and Nick Roberto sending the puck over the net. With just under four minutes left in regulation, Chad Kyrs sent Harper into the UND zone. He skated into the right circle and wired a shot under the crossbar for his 13th goal and a 2-2 tie. ► The Terriers had killed 27 consecutive power plays before yielding the man-advantage goal that ended their season. ● College Hockey News recap, What next for BU? Jack Eichel scored a pair of goals and added an assist as Buffalo thumped Toronto, 5-2. It was the sixth three-point game of the season for Eichel who now has a 23-30-53 scoring line in 54 games. Colin Wilson assisted on a pair of goals as Nashville routed San Jose, 7-2. Kevin Shattenkirk recorded his 38th and 39th assists in Washington’s 4-1 win against Arizona.